Airport hospitality specialist No.1 Traveller has agreed a new partnership with AirEuropa to offer its Business Class passengers and Elite Plus SkyTeam frequent flyers complimentary lounge access at No.1 Gatwick – South Terminal. The agreement is the 15th airline partnership for No.1 Traveller to provide complimentary lounge access to Business and First Class travellers at Gatwick, the UK’s second busiest airport. Claimed to be the world’s largest serviced residence owner-operator Ascott Ltd says it is on track to offer 40,000 apartments worldwide by 2015. 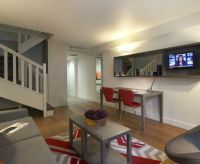 Units can be let from one night or more and are very much self-contained with comprehensively equipped kitchens, wi-fi and working/social areas. Business travellers account for 60% of renters. 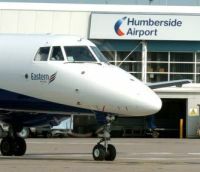 Probably Britain’s smallest truly international airport (234,000 passengers in 2012), Humberside, sited south of the Humber Bridge, is to gain a week-daily SAS flight to Copenhagen from the start of the winter season (28 October). 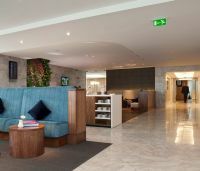 Servisair has opened the doors to its newest ‘Aspire by Servisair’ lounge at Manchester Airport Terminal One. It is available to all departing passengers irrespective of airline or class of travel. There are complimentary drinks and hot and cold food including bacon rolls for breakfast, soup of the day and luxury cakes. Guests can also take advantage of essentials such as free, unlimited wi-fi and charging facilities for laptops, iPads and mobile phone. Also available are private work booths. A new series called ‘Airport Live’ starts today (Monday) on BBC 2 and goes behind the scenes to show the complex operations that are necessary to allow millions of UK business travellers and holidaymakers to fly abroad every year. 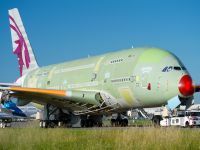 The Rolls-Royce powered Airbus A350 XWB prototype (F-WXWB) took to the sky for the first time 10:00 local last Friday (14 June 2013). A 4hrs 5mins flight followed. 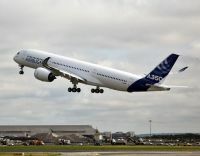 Expert opinion is that the A350 will make its full public debut at the opening day of the Paris Air Show today, with at least one simple pass down the flight line at an agreed height. Actual flight time between Toulouse and Le Bourget is less than one hour with a sortie to the show well within the scope of the flight test programme and not putting any pressures on the certification schedule. GetTaxi, the black cab ordering app, has launched a brand new service where passengers can book black cabs to the airport and take advantage of fixed fares. The average journey is claimed to be between 8-10% cheaper than typical private hire rates and passengers will also be reassured by drivers who can navigate their way round the capital using ‘the knowledge’ and use the bus lanes. Heathrow plane spotters (and those just interested) will be pleased to learn that British Airways will take delivery into the UK of its first two 787s on consecutive days, 26 and 27 June, followed by its first A380 on 4 July. They will arrive around mid-morning. British holidaymakers can now check the cost of any extra fees they might have to pay both their airline and airport, thanks to the UK Civil Aviation Authority’s (CAA) online fees and charges comparison tables. 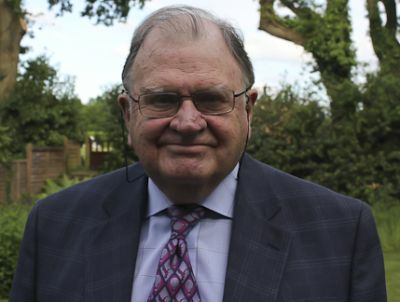 The European Commission is moving quickly ahead with its review of the Delta Air Lines and Virgin Atlantic commercial tie-up and is expected to issue an affirmative verdict by 20 June, its scheduled decision day. Delta, the second-biggest US airline by revenue, and Virgin Atlantic announced the deal in December last year, outlining a joint venture that would allow the carriers to code both carriers to offer more flights at Heathrow, the world’s busiest international airport. Last week London City Airport announced an all time record monthly 315,514 passenger throughput, and 15,697 on Friday 23 May alone. In its early years the annual number was less than a quarter of a million. On 30 June the airport celebrates 30 years since a special test flight from Herons Quays (now part of the Canary Wharf complex) took place to pave the way for what is now a key part of the regeneration of East London. Flights to the Republic of Seychelles have been dropped by Qatar Airway effective 1 September 2013. The daily service is flown by a two-class Airbus A319 and linked up with other points at the airline’s Doha hub. easyJet has signed a long-term contract with Stansted which will enable the airline to more than double its traffic at the airport over the next five years. Together with its operation at nearby Southend (but a different market area) it could justifiably call itself “Essex largest airline”. In fact it is Britain’s largest airline. Readers may recall that Jane Stanbury recently reported on the Nigerian Business Aviation Conference (BTN 13 May). Jane travelled to Nigeria via Virgin Atlantic Upper Class. Flying at the Front end is normally limited to about 1,000 words but she so much enjoyed the experience we have in this case allowed her more freedom. In any event this is really two reports, one on the ground and one in the air. 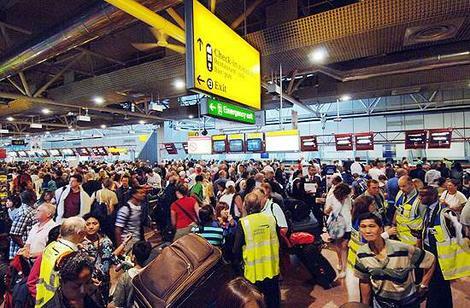 Last week European air traffic was sent into chaos with a last minute walkout by the French air traffic union SNCTA citing concerns over EU plans for a civil airspace review. A demand for more than 35,000 new aircraft is forecast over the next 20 years according to Boeing, who unveiled its annual Current Market Outlook last week. It forecast the world fleet to double over the next two decades. Both passenger and cargo traffic are expected to grow 5% annually. In a world first Emirates has announced plans to open an indoor aviation themed attraction in London this July. Located close by the O2 arena and the Emirates Air Line in Greenwich it will cover an area of almost 300sq m and provide an insight into the operations and modern achievements of commercial air travel. Passengers on Etihad Airways’ daily flights between New York and Abu Dhabi can now use their own mobile phones to text, browse and call, using Panasonic Avionics’ eXPhone service and AeroMobile, the in-flight mobile phone operator. 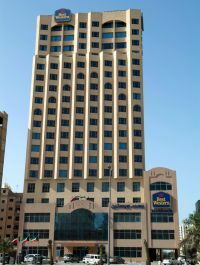 Named after the part of the city state where it is located the new 18-storey Best Western Mahboula hotel offers 96 rooms including 16 suites, with stunning views across the glittering Arabian Gulf. All guest rooms have complimentary internet access. 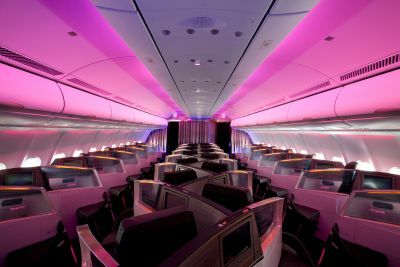 As previewed by Business Travel News (see BTN 1 April), SAS has launched its brand new service concept: SAS Go and SAS Plus, to replace Business Class, Economy Extra and Economy Classes. “The service classes that were created 30 years ago do not reflect the needs of the modern traveller. Time is now in short supply for most people, and our passengers want time efficiency and attractive prices, without any hidden charges. SAS Go and SAS Plus meet both of these needs”, said Richard Gustafson, CEO and Group President of SAS. 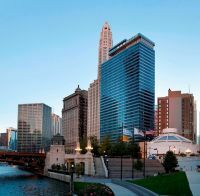 Chicago has seen the opening of the 334-room Wyndham Grand Chicago Riverfront, the former Hotel 71. The 39-storey property is located in the centre of downtown Chicago on East Wacker Drive, offers unparalleled views of the Chicago River and is close by the city’s famed Magnificent Mile, The Loop business district, theatre area and world-class heritage buildings.